"[I]t is certain that the tree shrews represent a highly important group of mammals, and, for this reason, they demand an intensive study from all aspects." "Among living non-primates the tupaiids are apparently the closest primate relatives, and these conclusions in no way lessen the value of tupaiids to primatology." Tree shrews (Scandentia, Tupaiidae) are small-bodied mammals from South and Southeast Asia. They have long been considered to have close affinities with primates and are often used as an outgroup in analyses of relationships among primate taxa (e.g., Shoshani et al., 1996). Despite volumes of recent debate concerning their relationships to primates and other mammals (see Luckett, 1980; MacPhee, 1993), the supraordinal relationships of tree shrews remain poorly understood. A better understanding of tupaiid evolutionary relationships has been hindered by their poor fossil record, which consists of teeth and skull fragments from the Miocene of India, Pakistan (Chopra and Vasishat, 1979; Chopra et al., 1979; Jacobs, 1980), China (Ni and Qiu, 2002; Qiu, 1986), and Thailand (Mein and Ginsburg, 1997), as well as the Eocene of China (Tong, 1988). 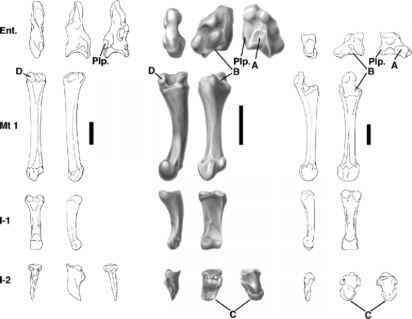 Only one postcranial specimen, a ribcage from the Pliocene of India reported by Dutta (1975), has been suggested to represent a tupaiid (see Sargis, 1999, for a review of tupaiid fossils). Furthermore, while tupaiid craniodental morphology has been relatively well studied (see Butler, 1980; Cartmill and MacPhee, 1980; MacPhee, 1981; Steele, 1973; Wible and Martin, 1993; Wible and Zeller, 1994; Wohrmann-Repenning, 1979; Zeller, 1986a,b, 1987), tupaiid postcranial morphology was poorly known and had not been studied from a functional morphological perspective prior to Sargis (2000). In order to gain a better understanding of the character states found in the Tupaiidae, which, in turn, should provide primate systematists with a better understanding of this often-used outgroup, I conducted a functional morphological study of the tupaiid post-cranium (Sargis, 2000, 2001, 2002a,b,c).